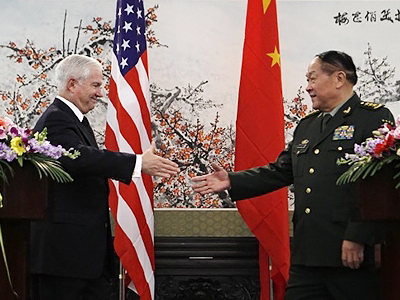 With China beginning to challenge America’s superpower status, US Secretary of Defense Robert Gates is in Beijing for three days of talks with Chinese top brass and President Hu Jintao. The US and Chinese defense ministers opened their talks on Monday with forced smiles and vague pledges. There was no hiding from the cameras, despite the political pageantry, that deep-seeded problems remain between Beijing and Washington. "The relationship between the military of China and the US is showing new development opportunities, while also facing some difficulties and challenges,” Liang Guanglie, Chinese minister of the national defence, told reporters after meeting with his US counterpart. “Both sides should make joint efforts to enlarge our common interests, resolve difficulties and disagreements and to make sure the relationship between the two militaries will move forward…"
Gates agreed, saying that "cooperation, collaboration and dialogue between the United States and China on security issues were in the mutual interest of both of our two countries." "Our exercises have not been directed in any way at China, rather they have been a result of our growing concern over the provocative behavior of North Korea,” Gates said. “Our efforts have been directed at deterring further provocations on the part of North Korea because of the danger of creating instability and escalating military activity in the region." Despite, or because of, America’s actions China continues to beef up its military arsenal. The worst setback to US-China relations happened just one year ago as Washington announced it would supply Taiwan, which China regards as its sovereign territory, with $6.7 billion worth of advanced military hardware, including two Osprey mine-hunting ships, 60 Black Hawk helicopters and surface-to-air missiles. Fears that Taiwan may eventually fight for its independence with US support has prompted China to invest in the construction of state-of-the-art warships and submarines, as well as the nation’s first aircraft carrier. The military deal with Taiwan was followed up in February by President Barack Obama’s invitation to host exiled Tibetan spiritual leader the Dalai Lama at the White House. China, which views the Dalai Lama as a separatist figure, condemned the private meeting as a "violation of US policy on Tibet". The Dalai Lama fled Tibet in 1959 after a failed uprising against the Chinese government. Meanwhile, rumors are circulating amongst the defense community that China is on the threshold of developing its own stealth fighter-jet, as well as other top-shelf weapons. Indeed, Gates said US intelligence underestimated how fast China was developing its military capabilities. Earlier, Gates had predicted that China would not have advanced-generation fighters for another decade. China is also reported to be constructing an anti-ship ballistic missile base in southern China’s Guangdong Province, which would have the ability, in some hypothetical confrontation, to hamper American aircraft carriers that now travel the area at will. Although the United States still enjoys military superiority over China, it is growing increasingly concerned by the Asian country’s tremendous knack for developing its own military technologies, which the US views as a potential future threat. But with so many other hot spot issues simmering in the region, most notably North Korea’s threatening nuclear posture against South Korea, Beijing and Washington need to put aside their suspicions and cooperate for a lasting peace in the region.